Simply, a CTA is a "Call to Action" -- a phrase, button, or image used to prompt a user to convert (micro or macro) on your site. It's critical to use CTAs to accomplish your website's goals-- whether downloads, purchases, or reviews. Also important are the types of CTAs and when each should be used to maximize their impact. The first step is to nail down your target audiences. Once you know who you're targeting, it's possible to create CTAs that will resonate and motivate. Having only one type of CTA may reduce conversions and exclude audiences that aren't likely to take the next step. Creating multiple types of CTAs to serve your different audiences and their goals will allow you to bring them down your marketing funnel. After that, it's essential to create your website's customer journey and funnel flow. This should outline how a user browses your site and the path to conversion. Remember that you want to: introduce your brand, showcase your offerings, provide some social proof, and then present the offer. Make sure your website supports this user flow and that there are appropriate CTAs for each step of the customer journey i.e., you don't want to have a "Buy Now" button on the navigation -- this CTA wouldn't be effective. Without further ado, here is your short and sweet guide to the types of CTAs and how to create effective messaging. Lead Generation :: This CTA should be placed in any spot on your website with a high percentage of new visitors. The most popular place people for this CTA is on the end of a blog post, in the sidebar, or as a floating banner in the corner. To be successful, these CTAs should be noticeable and communicate the value of clicking on it. Form Submission :: It can't be overstated how important it is to gain the information from as many of your visitors as possible. With this information, you can target your audience with other marketing strategies. 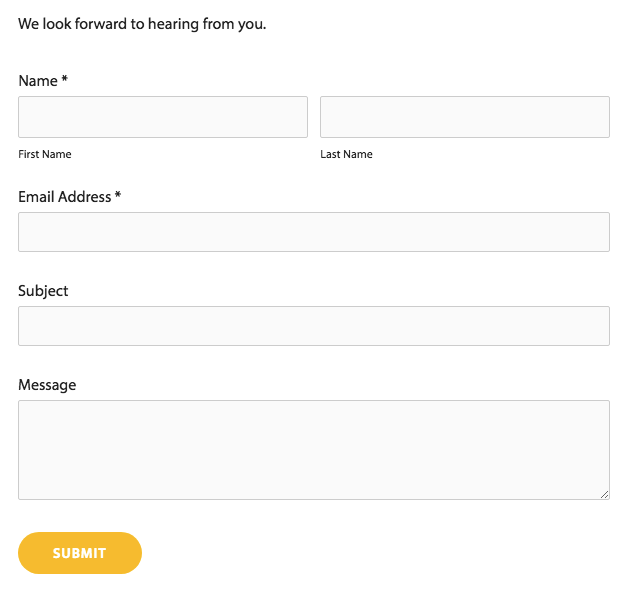 Giving your user something in return for their information can be a great way to get them to complete your form. "Read More" Button :: Any place you display a feed of content--your blog, your case study page, or news page--should have this button after a brief snippet of the content is featured. This will also allow you to independently analyze each post so you can see what your users are finding compelling. Product or Service Discovery :: When someone is on your website and learning about your business, make it as easy as possible. Your products and services are what keep your business afloat. The CTAs don't have to be fancy images -- simple text on a button can do the trick, as long as the button stands out enough against its background. Social Sharing :: Social sharing buttons are a great way for visitors, leads, and customers to engage with your brand across the web. These types of CTAs are easy to customize and can be included in places where it makes sense on your website -- blog posts, landing pages, etc. Lead Nurturing :: This type of CTA is a way to make a final push towards conversion. By offering something similar to your product or service, you can entice them to buy. Product demos, free trials, or free quotes are all examples of lead nurturing CTAs. Closing the Sale :: This push to turn a lead into a sale can benefit you by having a clear and sales-focused CTA. This type of CTA should be placed on product information pages. Event Promotion :: Throwing a party or event? Make sure it's attended by promoting your event with CTAs that include the date and time. A successful site will contain many CTAs to direct users into the next step of the marketing funnel. By strategically placing CTAs on your site, you can tap into meeting the needs of your user while also accomplishing the goals of your site.